This year marks the 500th anniversary of the first published organ music, Arnolt Schlick’s Tabulatur etlicher Lobgesang und lidlein (Mainz: Peter Schöffer, 1512). The book contains music for organ and lute, notated in old German tablature, with the treble voice on a staff and the lower parts in letters. There are 10 organ pieces, opening and closing with cantus firmus liturgical works. Treatments of vernacular songs are found between. The style of these works harkens back to a German tradition of making organ music known as the fundamentum, or foundations, of improvisation/composition. Conrad Paumann cantus firmi in different patterns (ascending stepwise, in thirds or fourths; descending in various intervals). The cantus firmus moves in uniform note values, while the organist creates figuration in much shorter notes above it; this style is related to Notre-Dame organum and was very different from the imitative polyphonic music cultivated by 15th-century Franco-Flemish composers. With his organ music, Schlick began to incorporate aspects of contemporary vocal style, its imitation and sequences, into the much older cantus firmus tradition. The other music in the Tabulaturen are song arrangements, where it is not always known whether Schlick composed the original polyphonic treatment or acted as the intabulator, adding figurations to a vocal model. 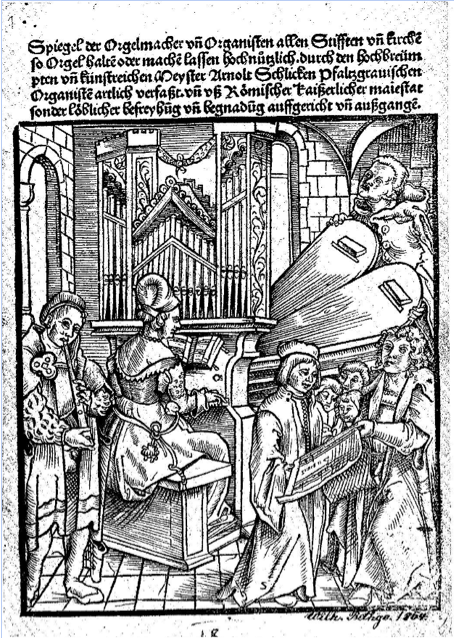 The year before he published his music, Schlick published a handbook on organ building, his Spiegel der Orgelmacher und Organisten (Mainz, 1511). In that work, he gives sample specifications for small (6’ starting on F) and large (12’ starting on F) organs. He was especially fond of reeds, and describes the unusual and varied forms of regal pipes and the inventions of organ builders with admiration, concluding that “Adams kinder feiern nit” (“Adam’s children never rest!”). Among the registers that he mentions in the Spiegel are the gemshorn, hintersatz (low-pitched mixture with many ranks), zimbel (high-pitched “schneiden” mixture), rauschpfeife (after the fashion of a schalmei), zink, a three-holed flute, Schwegel (a 3-holed flute played with one hand and used with tabor), and regals. The range of parts in Schlick’s organ music requires the pedal to play one or two voices. (Four voices are played by the pedals in Ascendo ad Patrem.) Schlick knew about registering the pedal at 16′ with the manual at 8′ but advised against it on the grounds that the harmony would be inverted when the pedal line crossed above the manual. However, one of his compositions, Pete quid vis, has a passage where the pedal crosses above the manual and produces 6/4 chords that aren’t treated properly, so the use of a 16’ in the pedal is warranted in this exceptional case. Schlick’s music shows the great sophistication of organ building and playing in German lands in the early 16th century. I felt that we couldn’t let the year pass without a fitting tribute, so I recently released a recording to help disseminate this remarkable music: http://www.gothic-catalog.com/Schlick_First_Printed_Organ_Music_p/lrcd-1124.htm . The frontispiece to Schlick’sSpiegel shows a female organist, so let’s have lots of women re-enacting the scene in the 21st century!